The Hyperforce Rangers finally got their Megazord, and it's as morphinominal as you'd expect! The Hyperforce Rangers found themselves having to fight one of their own and to survive the ordeal they had to get some help. That included aid by the Power Rangers RPM Gold Ranger, but it also resulted in finally getting to see their Megazord, the Chronos Hyperforce Megazord. 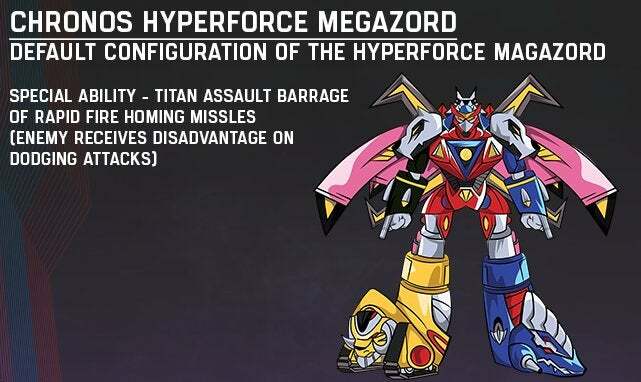 Hyper RPG released the image that fans viewed during the show, which shows the Chronos Hyeprforce Megazord in all its glory. The image notes that this is the default configuration of it, so expect a few more to pop up down the line. The default Megazord has the ability to fire off a Titan assault barrage of rapid-fire homing missiles, which aside from doing massive damage also hinders the enemy's ability to dodge attacks. From a design standpoint, the Megazord is one o the coolest looking Megazords in some time. It's incredibly sleek while still appearing physically powerful, and those Cerberus pauldrons are fantastic. The Ram and Serpent Hyper Zord boots are also a nice touch, giving the Zord some personality. You can view the Chronos Hyperforce Megazord in the image above. The Chronos Hyperforce Megazord is made up of the Cerberus Hyper Zord (Vesper the Black Ranger), the Lion Hyper Zord (Marv the Red Ranger), the Phoenix Hyper Zord (Chloe the Pink Ranger), the Ram Hyper Zord (Jack the Yellow Ranger), and the Serpent Hyper Zord (Eddie the Blue Ranger), and you can find out more about their individual abilities here. The Rangers needed all the help they could get in the recent episode of Hyperforce, as a corrupted Vesper (revealed to be an android in episode 6) turned on Eddie and the other Hyperforce Rangers. Luckily the remaining Rangers had the help of RPM's Gold Ranger, but it remains to be seen how Vesper's ordeal will affect the Rangers in the long run. Power Rangers Hyperforce airs on Hyper RPG Tuesday nights at 8 pm CST, and you can find more of coverage of the show as well as all things Power Rangers by following @MattMuellerCB!